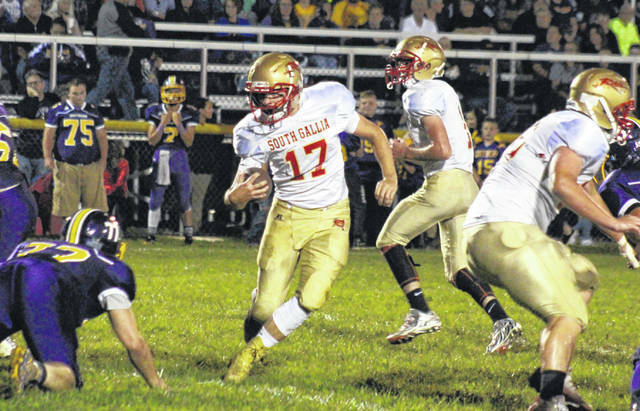 South Gallia’s Gavin Bevan (17) carries the ball up the middle, during the Rebels’ setback on Sept. 28 in Racine, Ohio. Last Week: Miller lost to Eastern 25-8, in Tuppers Plains; South Gallia defeated Wahama 42-20, in Mason. Last meeting between the teams: Oct. 27, 2017. Miller won 34-9 in Hemlock. MHS offense last week: 64 rushing yards, 102 passing yards. SGHS offense last week: 349 rushing yards, 138 passing yards. MHS offensive leaders last week: QB Colby Bartley 11-of-22, 102 yards, 1TD, 2INTs; RB Blayton Cox 19 carries, 48 yards; WR Kylan McClain 4 receptions, 67 yards, 1TD. SGHS offensive leaders last week: QB Tristan Saber 5-of-9, 62 yards, 2TDs; RB Kyle Northup 20 carries, 137 yards; WR Jared Ward 2 receptions, 86 yards, 2TDs. SGHS defense last week: 44 rushing yards, 143 passing yards. 1. The all-time series between these teams is time at nine wins apiece. Since SGHS joined the TVC Hocking prior to the 2010 season, the Rebels are 5-3 against MHS. Miller claimed a 46-13 victory over SGHS in its last trip to Mercerville, on Oct. 28, 2016. 2. After the touchdown, South Gallia has converted 12 times in 23 chances this fall. The Rebels are 5-of-9 on point-after kicks, 5-of-9 on two-point runs, and 2-of-5 on two-point passes. 3. The Rebels have went to the run 205 times this season, while attempting 83 passes. Kyle Northup’s 142 carries are 74-more than his nearest teammate, with his totes resulting in 842 yards and eight touchdowns. Tristan Saber is responsible for 78 of the team’s pass attempts, completing 37 for 331 yards and four touchdowns. 4. Only one of Miller’s two wins count toward its OHSAA ranking. The Falcons’ most recent victory, a 30-20 win at home over Middletown Christian, does not, as the Eagles are a club team. 5. Both teams have been eliminated from playoff contention. SGHS 19th in Region 27, while the Falcons are 21st. A total of 13 teams in the region enter Week 9 below .500. Last Week: Gallia Academy defeated Rock Hill 43-20, in Gallipolis; Ironton defeated Coal Grove 21-12, in Ironton. Last meeting between the teams: Oct. 20, 2017. Gallia Academy won 38-20, in Gallipolis. GAHS offense last week: 232 rushing yards, 180 passing yards. IHS offense last week: 230 rushing yards, 82 passing yards. GAHS offensive leaders last week: QB Justin McClelland 13-of-19, 180 yards, 1TD; RB Justin McClelland 13 carries, 81 yards; WR Cory Call 4 receptions, 51 yards. IHS offensive leaders last week: QB Gage Salyers 7-of-13, 82 yards, 1INT; RB Reid Carrico 15 carries, 97 yards; WR Brycen Thomas 3 receptions, 35 yards. GAHS defense last week: 278 rushing yards, 0 passing yards. IHS defense last week: 139 rushing yards, 188 passing yards. 1. These schools first met on the gridiron in 1923 and Ironton holds the edge in the series by a 45-13 clip. Prior to last season, GAHS had fell in seven straight bouts with the Fighting Tigers. Gallia Academy’s last win at Tanks Memorial Stadium was on Oct. 6, 2006, by a 14-7 final. 2. The winner of this game clinches a share of the Ohio Valley Conference title. Ironton won the OVC in 2015 and 2016, while Gallia Academy’s last league title came in 2012 in the Southeastern Ohio Athletic League. 3. The Blue and White have found the end zone 47 times this season, with nine different players scoring. Jacob Campbell leads the way with 16 scores, followed by James Armstrong with 10 and Lane Pullins with nine. Justin McClleland has found paydirt seven times, Cory Call, Cade Roberts Daneuvyn Woodson, Jacob Hill and Briar Williams each have one score. 4. Gallia Academy’s offense is averaging 409.8 yards per game, while its defense is allowing just 259.2 yards per contest. The Blue Devils do trail by a 11-to-7 count in the turnover battle, however. 5. Both teams control their own playoff destiny. The Blue Devils enter the week at third in Region 15, in which they are one of two 7-1 teams. The Fighting Tigers are one of three 6-2 Region 19 teams, and IHS enters Week 9 at third in the region. Last Week: River Valley lost to Vinton County 35-0, in Bidwell; Athens defeated Wellston 39-14, in The Plains. Last meeting between the teams: Oct. 20, 2017. Athens 39-7 in Bidwell. Current head-to-head streak: Athens has won 2 straight. 1. River Valley has just one win over Athens in Tri-Valley Conference Ohio Division play. The Raiders fell by a 25-15 final the last time they visited the Bulldogs, on Oct. 21, 2016. 2. Last week was River Valley’s fourth shut out loss of the season. The Raiders hadn’t been blanked four times in the same year since 2000. 3. Dating back to last season, RVHS has dropped seven straight league games. Meanwhile, Athens has the second-longest current TVC Ohio winning streak, at four games in a row. 4. During the Bulldogs current overall six-game winning streak, only one game has been decided by one-possession. Athens’ largest win during the stretch was a 50-0 triumph in Week 4. 5. The Bulldogs enter the game at eighth in the Region 11 playoff rankings. There are six teams in Region 11 with at least seven wins headed into Week 9. Meanwhile, River Valley is mathematically eliminated from the Region 19 playoffs, as one of four winless teams in the region.